Last weekend the Pro-Life Witness took place, as usual on the fourth Saturday of the month. 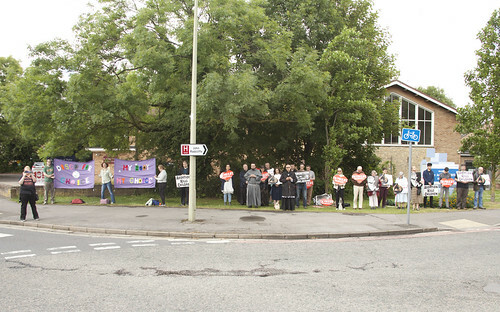 It is an hour of people praying the Rosary, outside the John Radcliffe Hospital in Headington, the only place in Oxford and its environs where abortions take place. But they don't take place on Saturdays. 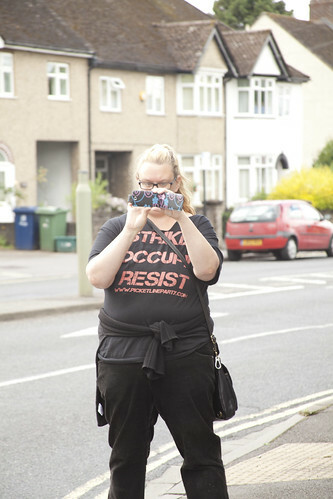 The occasional pedestrian, bus, and car pass us on the way to the hospital, but as it happens they aren't on their way to the abortion clinic, and we don't do any pavement counselling. It is all very simple and low key. Nevertheless this small prayer witness has attracted an aggressive counter-demonstration; after being told by the Police they should not actually stand in front of us to hold up sheets to try to obscure our signs, they now limit themselves to playing music to drown out the Rosary. We maintain this degree of good behaviour by videoing the whole affair. 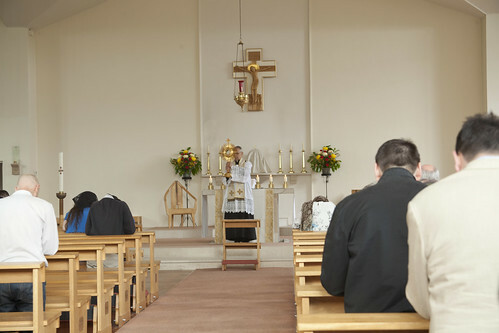 They numbered four last weekend, whereas there were about 25 of us, including two priests and a Franciscan friar, and some more praying before the Blessed Sacrament in the church next to us. The pro-abortionists call themselves 'Disco for Choice', and their token gyrations can be seen if you double click on this photo and toggle between it and the next one in the album. Despite the enforced jollity they looked fairly glum, especially the leader of the gang who expresses her disapproval of being filmed and photographed by filming and photographing us. Regular readers may be surprised to hear that, when I read the remarks of the new President of the Italian Bishops' Conference, Archbishop Gelantino, distancing himself from the 'inexpressive (or 'expressionless') faces' of those who pray outside abortion clinics, I was at a loss for words. Here, however, are some words of Edward Peters, the canon lawyer who blogged about this here. I prayed my first rosary outside an abortuary in 1978. I don’t recall what my expression was, but I doubt I was smiling. I have prayed many rosaries outside of many abortion mills since then, have picketed them, side-walk witnessed at them, passed out literature around them, and even drove two women (who had showed up for abortions) to pro-life agencies where they sought assistance toward sparing their babies from abortion. I probably smiled on those two days. At the same time—even though usually things are quiet (deathly quiet) outside an abortion chamber—I have nevertheless also been screamed at by clinic personnel, cursed at by passers-by, drenched in the rain, had a brick tossed over a wall at me, and once watched a driver gesture the ‘trigger finger’ at me. But even if I had the presence of mind to rejoice at these insults borne for the sake of the least of His children, I’m pretty sure I did not show it on my face. I wonder, does every feeling need to be shown? And what exactly should one feel outside a death chamber? For myself, I don't support these initiatives because of a great optimism about the pro-life cause. It is more that, seeing the greatest single moral evil of our generation taking place in our own quiet streets, with the approval of the law, I feel that it is morally necessary for as many of us as possible not only to pray, but to protest in public, to show that not everyone is passing the victims on the other side of the street. The evil may continue, but at least we made a token protest. A wonderful apostolate. May this witness continue to flourish! One of the hardest things to do. With no support (generally, and often, derision) from our Church leaders. As I have commented elsewhere, demonstration must be appropriate and yours against the Radcliffe Hospital which is complicit in an evil, clearly is. The counter demo was not, in that it was aggressive and threatening, and you were right to raise this with the police. Incidentally Our Lady will have no difficulty in hearing your prayers above the counter-din. As for Disco for Choice, the one thing their policy will ensure is the fertilised embryo, or foetus, or unborn child, all of which they were at some time, will certainly not get any choice in the matter. this may be posted twice however have you seen anything less feminine than woman or is that womyn taking the photo of you all. Without wanting to get drawn into a long argument, may I suggest that both of these comments show an incomplete understanding of what it means to be made in the image of God (imago Dei)? I have prayed the rosary outside the Santo Spirito hospital in Rome, near the Vatican. I also carried a large poster with pictures of late term abortions. I have never seen any one else do this in Rome. Mons. Ignacio Barreio of the Human Life International told me that they don't do it. There were many emotional reactions from women here who had abortions, when they saw the pictures on my 'mostra'(exhibition). 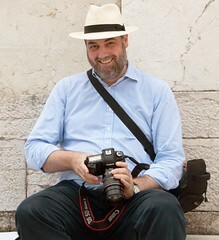 Possibly the Italian clergy here have the same attitude as that of the new President of the Italian Bishops Conference.